EFFECTS OF VIROLA SNUFF are felt within minutes from the time of initial use. First there is a feeling of increasing excitability. This is followed by a numbness of the limbs, a twitching of the face, a lack of muscular coordination, nasal discharges, nausea, and, frequently, vomiting. Macropsia - the sensation of seeing things greatly enlarged - is characteristic and enters into Waiká beliefs about hekulas, the spirit forces dwelling in the Virola tree and controlling the affairs of man. During the intoxication, medicine men often wildly gesticulate, fighting these gigantic hekulas. CAUSE OF THE NARCOTIC EFFECT of Virola has been shown by recent studies to be an exceptionally high concentration of tryptamine alkaloids in the resin. Waiká snuff prepared exclusively from the resin of Virola theiodora has up to 8 percent of tryptamines, mainly the highly active 5-methoxy-N, N-dimethyltryptamine Two new alkaloids of a different type--,B-carbolines-- have also been found in the resin; they act as monoamine oxidase inhibitors and make it possible for the tryptamines to take effect when the resin is taken orally. OTHER WAYS OF TAKING VIROLA RESIN besides snuffing it are sometimes employed. The primitive nomadic Maku of Colombia often merely scrape resin from the bark of the tree and lick it in crude form. The Witoto, Bora, and Muinane of Colombia prepare little pellets from the resin, and these are eaten when, to practice witchcraft or diagnose disease, the medicine men wish to 'talk with the spirit people"; the intoxication begins five minutes aher ingestion. There is some vague evidence that certain Venezuelan natives may smoke the bark to get the intoxicating effects. USE OF VIROLA AS AN ARROW POISON by the Waiká Indians is one of the recent discoveries in the study of curare. The red resin from the bark of Virola theiodora is smeared on an arrow or dart, which is then gently heated in the smoke of a fire (shown in the illustration below) to harden the resin. The killing action of the poison is slow. The chemical constituent of the resin responsible for this action is still unknown. It is interesting that although the arrows are tipped while the hallucinogenic snuff is being prepared from resin from the some tree, the two operations are carried out by different medicine men of the same tribe. Many other plants are employed in South America in preparing arrow poisons, most of them members of the families Loganiaceae and Menispermaceae. 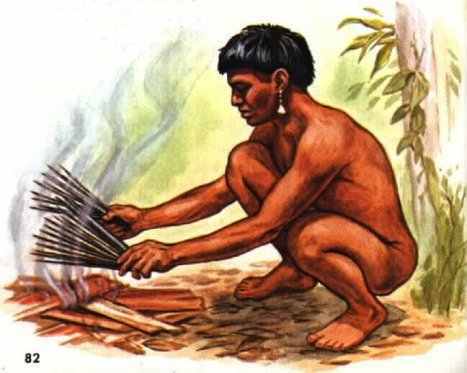 Waiká Indian holding poison darts in smoky fire to congeal Virola resin, applied by dipping or spreading with fingers. MASHA-HARI (Justicia pectoralis var. stenophylla) is a small herb cultivated by the Waiká Indians of the Brazilian- Venezuelan frontier region. The aromatic leaves are occasionally dried, powdered, and mixed with the hallucinogenic snuff made from resin of the Virola tree. Other species of Justicia have been reported to be employed in that region as the sole source of a narcotic snuff. Hallucinogenic constituents have not yet been found in Justicia, but if any species of the genus is utilized as the only ingredient of an intoxicating snuff, then one or more active constituents must be present. The 300 species of Justicia, members of the acanthus family, Acanthaceae, grow in the tropics and subtropics of both hemispheres. 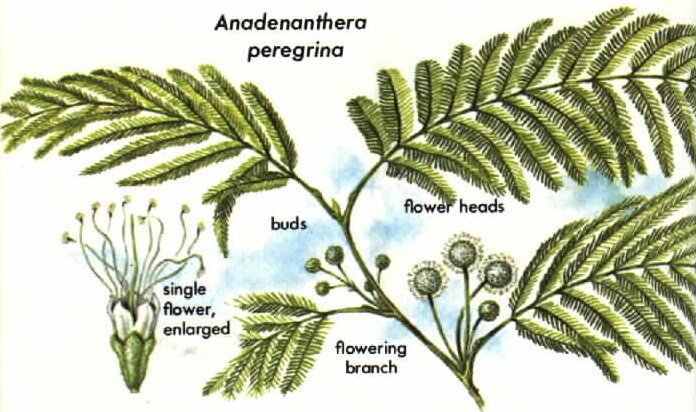 JUREMA (Mimosa hostilis) is a poorly understood shrub, the roots of which provide the "miraculous jurema drink," known in eastern Brazil as ajuca or vinho de jurema. Other species of Mimosa are also locally called jurema. Several tribes in Pernambuco--the Kariri, Pankarurú, Tusha, and Fulnio - consume the beverage in ceremonies. Usually connected with warfare, the hallucinogen was used by now extinct tribes of the area to "pass the night navigating through the depths of slumber" just prior to sallying forth to war. They would see "glorious visions of the spirit land . . . (or) catch a glimpse of the clashing rocks that destroy souls of the dead journeying to their goal or see the Thunderbird shooting lightning from a huge tuft on his head and producing claps of thunder . 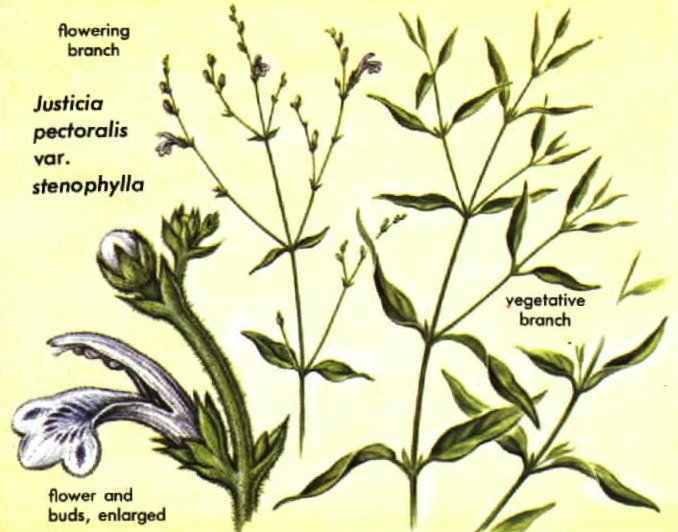 . ." it appears, however, that the hallucinogenic use of M. hostilis has nearly disappeared in recent times. Little is known about the hallucinogenic properties of this plant, which was discovered more than 150 years ago. Early chemical studies indicated an active alkaloid given the name nigerine but later shown to be identical with N. N-dimethyltryphmine. Since the tryptamines are not active when taken orally unless in the presence of a monoamine oxidase inhibitor, it is obvious that the jurema drink must contain ingredients other than M. hostilis or that the plant itself must contain an inhibitor in its tissues. The genus Mimosa, closely allied to Acacia and Anadenanthera, comprises some 500 species of tropical and subtropical herbs and small shrubs. 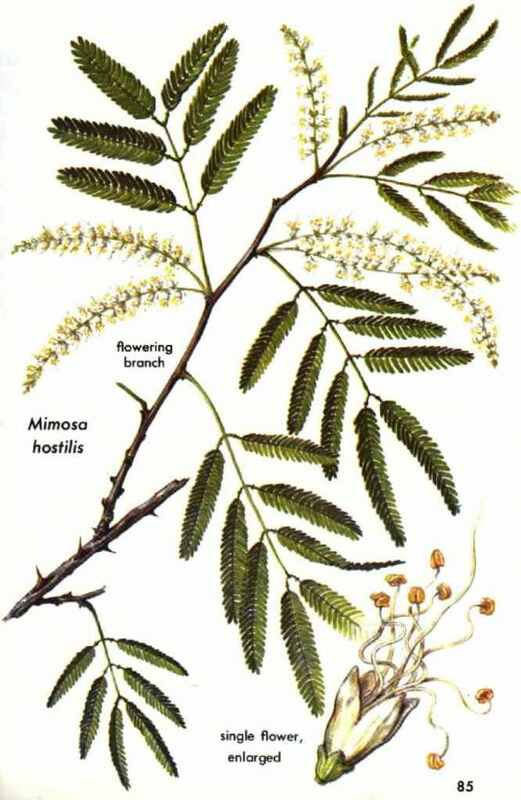 The mimosas belong to the subfamily Mimosoideae of the bean family, Leguminosae. Most of them are American, although some occur in Africa and Asia. Jurema is native only to the dry regions of eastern Brazil. YOPO or PARICA (Anadenanthera peregrina or Piptadenia peregrina) is a South American tree of the bean family, Leguminosae. A potent hallucinogenic snuff is prepared from the seeds of this tree. The snuff, now used mainly in the Orinoco basin, was first reported from Hispaniola in 1496, where the Taino Indians called it cohoba. Its use, which has died out in the West Indies, was undoubtedly introduced to the Caribbean area by Indian invaders from South America. The hallucinogenic principles found in A. peregrina seeds include N. N-dimethyltryptamine, N-monomethyltryphmine, 5-methoxydimethyltryptamine, and several related bases. Bufotenine, also present in A. peregrina seeds, apparently is not hallucinogenic. Elucidation of the chemical make-up of the seeds of the yopo tree has only recently been accomplished. Future studies may increase our knowledge of the active principle of these seeds. THE PREPARATION OF YOPO SNUFF varies somewhat from tribe to tribe. 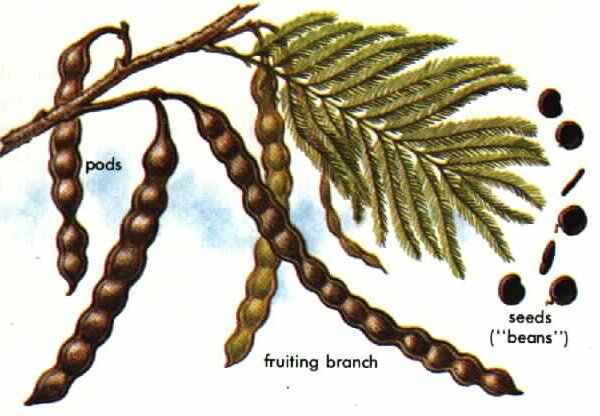 The pods, which are borne profusely on the yopo tree, are flat and deeply constricted between each seed. Gray-black when ripe, the seed pods break open, exposing from three to about ten flat seeds, or beans. These are gathered during January and February, usually in large quantities and often ceremonially. They are first slightly moistened and rolled into a paste, which is then roasted gently over a slow fire until it is dried out and toasted. Sometimes the beans are allowed to ferment before being rolled into a paste. After the toasting, the hardened paste may be stored for later use. Some Indians toast the beans and crush them without molding them into a paste, grinding them usually on an ornate slab of hardwood made especially for the purpose. Several early explorers described the process. In 1801 Alexander von Humboldt, the German naturalist and explorer, detailed the preparation of yopo by the Maipures of the Orinoco. In 1851, Richard Spruce, an English explorer, visited the Guahibos, another tribe of the Orinoco, and wrote: " in preparing the snuff, the roasted seeds of niopo are placed in a shallow wooden platter that is held on the knee by means of a broad handle grasped firmly with the left hand; then crushed by a small pestle of the hard wood of pao d'arco . . . which is held between the fingers and thumb of the right hand." The resulting grayish-green powder is almost always mixed with about equal amounts of some alkaline substance, which may be lime from snail shells or the ashes of plant material. Apparently, the ashes are made from a great variety of plant materials: the burned fruit of the monkey pot, the bark of many different vines and trees, and even the roots of sedges. The addition of the ashes probably serves a merely mechanical purpose: to keep the snuff from caking in the humid climate. The addition of lime or ashes to narcotic or stimulant preparations is a very widespread custom in both hemispheres. They are often added to betel chew, pituri, tobacco, epena snuff, coca, etc. In the case of yopo snuff, the alkaline admixture seems not to be essential. Some Indians, such as the Guahibos, may occasionally take the powder alone. The explorer Alexander von Humboldt, who encountered the use of yopo in the Orinoco 175 years ago, mistakenly stated that ". . . it is not to be believed that the niopo acacia pods are the chief cause of the stimulating effects of the snuff . . . The effects are due to freshly confined lime.' in his time, of course, the presence of active tryptamines in the beans was unknown. 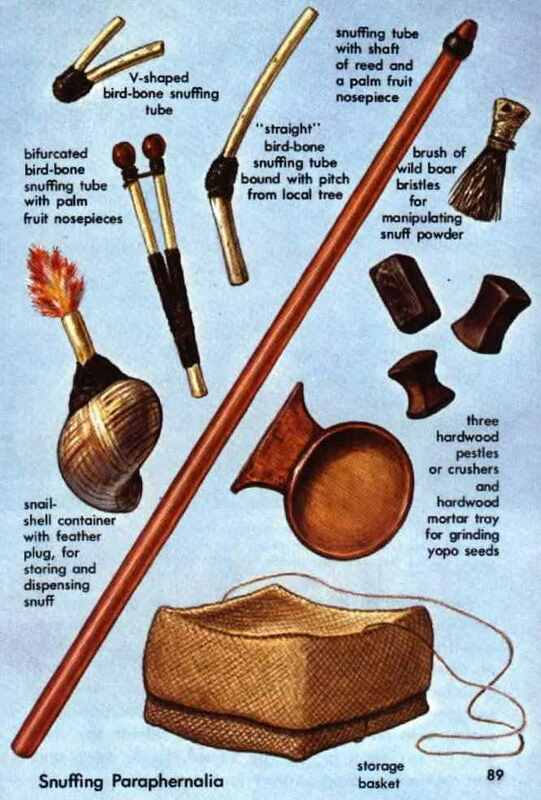 Yopo snuff is inhaled through hollow bird-bone or bamboo tubes. The effects begin almost immediately: a twitching of the muscles, slight convulsions, and lack of muscular coordination, followed by nausea, visual hallucinations, and disturbed sleep. 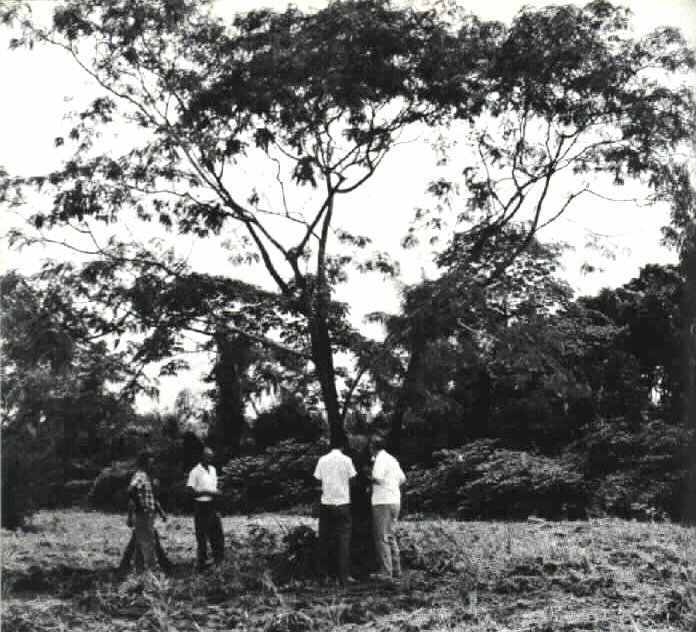 An abnormal exaggeration of the size of objects (mocropsia) is common. In an early description, the Indians say that their houses seem to ". . . be turned upside down and that men are walking on their feet in the air." A yopo tree (Anadenanthera peregrina) in Amazonian Brazil. The seeds of this tree are the source of a potent hallucinogenic snuff.